Growing up one of my favorite movies was Beauty and the Beast. The budding love between a grizzly monster and a beautiful bookworm teamed with a talking teacup, candlestick, and clock sucked me in every time I hit play on the VCR—which was a lot. Now, twenty years later, when I feel like reminiscing, I reach for my Beauty and the Beast Blu-ray. Home entertainment has come a long way over the years from VHS to DVD to Blu-rays and streaming content. As we move into 2011, Blu-rays are gradually gaining ground on DVDs and standing strong against streaming media, while VHS is now fully a thing of the past. In the age of constantly changing technology, though, I’m left wondering if I’m going to need to upgrade my cherished film once again. However, after considering the following factors, I’m confident that I won’t have to adapt to a new format for awhile. Last November, Netflix began offering a streaming-only plan—but there’s a catch. Due to licensing deals, their library of streaming content is significantly smaller than what is available via physical discs through the mail. For example, three of the six major Hollywood studios will not distribute movies and television series through Netflix’s streaming service until typically at least seven years after the DVD release.1 Search Netflix. You won’t be able to find award-winning television series like Band of Brothers and True Blood or hot new film releases like Due Date, Megamind, or The Social Network in the streaming format. Streaming media may push Blu-rays to be the last physical form of entertainment. At the 2011 Consumer Electronics Show, filmmaker Oliver Stone said Blu-rays are about film preservation. “It's the last hardware, the best of the last hardware. There won't be any other hardware now," he said.2 Blu-rays are of a higher quality and come with extras and bonus features that DVDs, and streaming media just can’t offer. For example, the Blu-ray for Avatar trumps the DVD version, offering not only a better quality picture and sound, but also several more hours of material that has never been seen before as well as extra features. As Blu-rays become more commonplace, prices for both the discs and the players have dropped. On Amazon.com you can buy a 3D-enabled Blu-ray player that streams Netflix over Wi-Fi (contradictory, I know) and plays media files from your computer for under $200. And with usually only a $10 difference between DVDs and Blu-rays, it’s a small price to pay for a higher-quality disc that will last longer. Over the holiday season, six million people received Blu-ray players, and now they’re jonesing for content.6 As more and more people switch to Blu-ray, it may be best to compliment your DVD collection with Blu-ray counterparts. Midwest Tape makes it easy to find the newest Blu-ray releases. 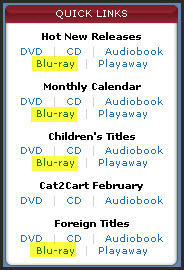 Look for links to several of our Blu-ray collections under the Quick Links tab on our homepage. How is Blu-ray circulating at your library? Do you find more people checking out Blu-rays as opposed to DVDs? Following the holiday season, have you noted an increase in Blu-ray demand? Share your thoughts and experiences here as comments. 2011 in Preview: Films TAKE TWO! 2011 in Preview: Films TAKE ONE!